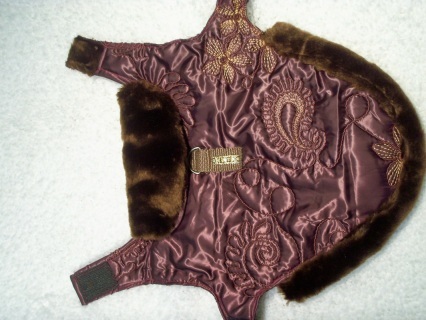 TRIMMED IN FAUX FUR AND EMBELLISHED WITH LEASH CLIP AND FAUX JEWELS ON THE LEASH STRIP. MEASUREMENTS FROM BASE OF NECK TO BASE OF TAIL ARE NEEDED AS EACH COAT IS CUSTOM MADE TO FIT YOUR DOG. CALL 419-610-6084 TO GIVE MEASUREMENTS FOR COAT. COATS ARE HAND-CRAFTED AND NON-RETURNABLE. BEAT THE SUMMER "ITCHIES" WITH THE BEST GROOMING PRODUCTS! Click on the link above for the most effective, non-toxic products I have ever used for dental care! The grooming products will eliminate bad odors on your pet-and promote healthy skin and coat. SAME ACTIVE INGREDIENT AS CAPSTAR-THE PERFECT CAP TO USE AFTER SHOWS OR VET VISITS, ETC. NOTE*** WE WILL NOT DISTRIBUTE PRODUCTS CONTAINING AMITRAZ-AS IT HAS REPORTEDLY BEEN INVOLVED IN CAUSING ALOPECIA.